Kinder Surprise has a new contest! 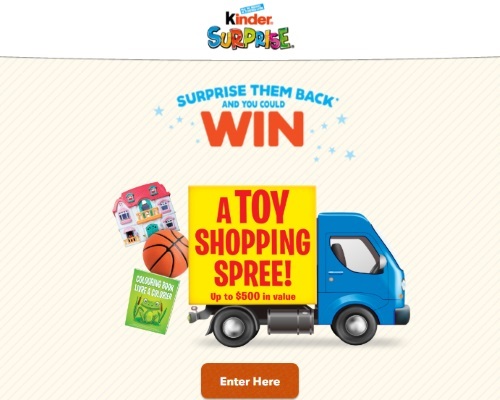 Surprise your kids and you could win a Toy Shopping Spree (up to $500 in value)! There are 10 grand prizes of $500 Shopping Spree, 50000 instant win prizes of a print-out letter, a single booklet of children's activity pages and a single sheet of stickers. Plus 20,000 print out letters, and single booklet of children's activity pages. Contest closes December 31, 2017.